Our digital marketing Case Studies feature some of our recent projects in Mobile-Friendly and Responsive Web Design & Development, WordPress Web Development, Search Engine Optimization (SEO) and Google Ads Pay-Per-Click(PPC) Marketing. We have helped many small and medium businesses update their dated websites to new mobile-friendly and responsive websites; improve their search rankings on Google and other search engines; reach more leads, customers and mobile users through their websites, SEO and Google Ads marketing campaigns; and build a strong online presence. New Website Design: Mobile Responsive Web Design & Development of a New Website of more than 200 pages. Dental SEO & Google Ads Marketing: SEO Optimization and Google Ads Marketing of an existing dental website in collaboration with Kash Data Consulting. 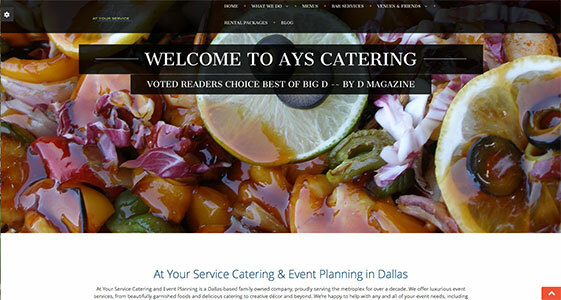 Existing Website Updates: Web Development of New Pages, Website Updates & Landing Page Optimization for an existing catering website. Lawyer SEO: SEO Optimization of an existing legal website in collaboration with Kash Data Consulting.